If interested in receiving listing notifications for any set or subset of the lists above, let us know. We can also add criteria for bedroom count, square footage, and max HOA dues. 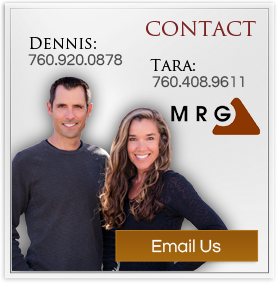 -Dennis C. & Tara P.
This entry was posted in Real Estate Blog on August 7, 2018 by Dennis Cox. [Original article from March 30, 2018:] We know you are frustrated, buyers! You want buy something in Mammoth but do not currently have many choices. Our inventory is at a 14-year low (only 52 condos for sale as of today!) so there is only one or maybe two listings that fit your criteria. Plus, many listings are kept on a nightly rental program and, therefore, are rented and unavailable when you are in town to look at them! However, we are hopeful that we have the typical increase in inventory this time of year as rental income from the ski season starts to dry up and would-be sellers are more ready to list. 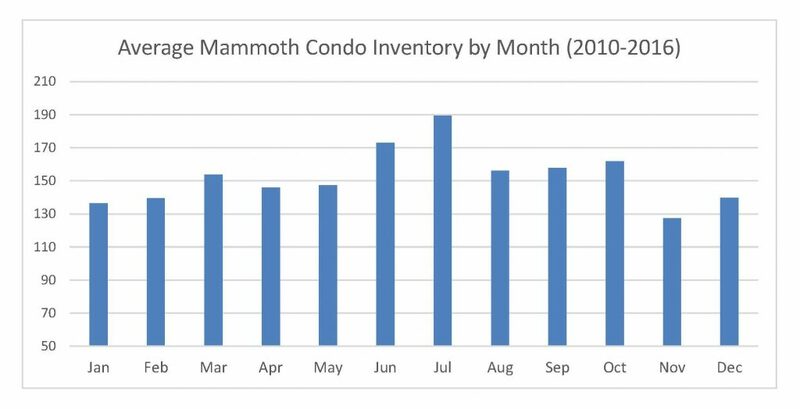 Last year (2017) was a bit of an aberration (inventory went down 24% from spring to summer) because Mammoth announced it was being purchased by KSL in April, plus we were just digging out from an amazing snow year, which both helped kick off a buying spree. Let’s hope we get back to the same spring bump in inventory and get our choices up to at least 70 condo listings (hopefully 90!) by summertime. Update as of April 24, 2018: We now have 59 condos for sale, so inventory is slowly creeping upwards as predicted. Single Family Homes: In the last 5 years, our single family home inventory swelled an average of 43% between May and August. With snow melting and daffodils popping up, would-be sellers are tending their gardens and doing projects to get homes ready for market. Update as of May 28, 2018: We now have 80 condos for sale! That is a 54% increase from a little over 8 weeks ago. Buyers now have a lot more to choose from and sellers better beware of more competition on the market. Historically, we still have low inventory: the average number of condos on the market over the last 15 years is 140. As for single family homes, we have not had our seasonal increase in inventory yet. We are still at 34 Homes for sale, the same as one month ago. This entry was posted in Real Estate Blog on March 30, 2018 by Dennis Cox. 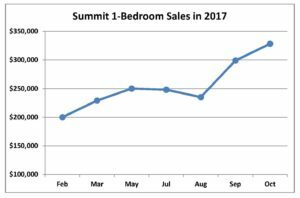 While we wait for the perfect winter storm to kick-start our ‘17/’18 ski season, the Mammoth real estate condo market is in the midst of a wild rise in prices. The average $/sqft for non-Intrawest 1-bedroom condos has shot up 44.1% from Q2 to Q4 (thru Dec 3). (Intrawest condos like The Village, Westin, and JSL were excluded because they tend to skew the data higher and not enough were sold to make it relevant). One stark example comes from The Summit condos near Eagle Lodge. See the chart below for sale prices of 1-bedroom condos in 2017. There was some variance in the condition and location of each condo, but the variances were not enough to explain the overall 64% jump $200k to $328k. It started back in mid-April 2017 when KSL Capital, a partnership related to Aspen Resort, announced its purchase of Mammoth Mountain Resorts (which includes June, Big Bear and Snow Summit). Being brought in with other resorts like Squaw and Deer Valley created speculation that maybe our ‘temporary’ white tent at Eagle Lodge will finally be developed into a proper lodge, along with other investment. This, after Mammoth was emerging out of an Epic Winter that dropped over 20 feet of snow in the month of January alone. (We just sold a condo that still has damage from that perfect storm; contractors have been in very short supply to repair all the damage.) Folks around town are hoping for a more ‘normal’ winter this year; was it a case of too much of a good thing? A quick drive around town revealed collapsed decks, lopped-off chimneys, and scrunched cars. Despite the snow’s effect on structures and our shoveling muscles, Mammoth Mountain had great visitation and condo rentals were very strong. Transient Occupancy Tax (the town tax that is collected on all nightly rentals) had 6 consecutive record-breaking months from Dec-May! The AirBnB Effect: Because of the higher rental income noted above, more buyers want to get in on the AirBnB phenomenon. They first hear about the commission rates that large rental companies in Mammoth charge (40-45% for most, up to 60% at The Westin) and realize, hey I can cut out this huge middleman and manage rentals myself from my phone. It is not quite as easy as that, but many buyers already have experience with AirBnB elsewhere and want to expand their portfolio. Many are trying for their first time and therefore want something small that is manageable, thus the run on 1-bedroom condos mentioned earlier. Perfect Storm: This trifecta of factors, in our opinion, have drastically increased interest in small condos in Mammoth. Through Dec 4th of 2017, there have been 378 condo sales compared to 303 sales in all of last year. Condos started selling more quickly last spring, creating a dearth of inventory (we are at our lowest inventory level in 14 years! ), leading to multiple offers and a rise in prices. Labor Day often marks the start of a mini buying spree as buyers want to get their rental set up before Thanksgiving. This year was tougher because of limited options on the market, so many agents took to trying to find off-market listings and buyers were willing to pay over the asking price. While low interest rates also helped some, it is still hard to beat an all-cash offer with no appraisal or loan contingencies. Lately, however, we are feeling some resistance to some of the higher list prices that sellers are throwing out there to see what sticks. A standard 2-bedroom condo at Sunstone was just listed for $575,000 when the last sale was for $425,000 last April. This 36% jump hearkens back to the days leading up to the last market peak (i.e. 2004-ish), but our prices are still below the last peak (i.e. when someone paid $710,000 for a 2-bd Sunstone!). This entry was posted in Real Estate Blog on December 4, 2017 by Dennis Cox. * Shelter Distillery – Locals and visitors alike are anxiously anticipating the opening of this first distillery in Mammoth! Shelter Distillery is located in The Village at Mammoth, adjacent to Gomez’s restaurant. The distilling began a couple of months ago and the grand opening is slated some time in December (hopefully mid December!). They will be offering food as well and we’re looking forward to seeing what kind of tasty offerings they will have! Owners Matt and Gracie Hammer also own Black Velvet Coffee (located in the outlet mall on Main Street) and we’ve already seen the quality of what they offer in the way of coffee so are super excited to see what they are going to offer in the way of spirits! * The new Bleu – You may have already partaken in the goodies at Bleu (charcuterie, cheeses, freshly baked breads, wine, beer, etc. ), currently located right next door to Base Camp Cafe on Main Street. However, the owners, Theresa and Brandon Brocia, are opening an expanded version of their existing shop in a new location off of Old Mammoth Road in the old ChartHouse building (across from Good Life Cafe and Nik N Willies). Their expanded offerings will include meals to go (Lunch and Dinner boxes and “Event-Ready” platters) and a lounge that will seat up to 50 people. Keep an eye out for the opening of the new Bleu hopefully in February sometime! * Grocery Outlet – You may have already noticed the construction along Old Mammoth Road (across from Rite Aid and the DIY center) and wondered what is coming. This is the location of what will essentially be Mammoth’s 4th grocery store. Currently, we have Vons, Sierra Sundance Whole Foods, and Busy Beez General Store. The new Grocery Outlet is proposed to be approximately 20,000 square feet in size. No dates set yet for a tentative opening. What if you could start your Mammoth house hunting from anywhere in the world? Well, now you can with our new Virtual Reality / 360° video house-hunting program. Before you arrive in Mammoth, we can set up your own personal portal for viewing VR/360 videos of the properties you and your agent have preselected from the MLS. The videos are organic and are narrated by one of us who is on site telling you about all the features (and sometimes, smells!) of the property. This video experience is a full immersion into the property from top to bottom. You will be able to decide if the property is one you would like to see in person on your next visit to Mammoth. This will allow you to enjoy more of your vacation time with family and friends on the slopes and not waste time on properties that are not what you are looking for. In addition, on busy weekends when many properties are rented and unavailable to see, you still can view them on your private portal on your phone or computer while you are enjoying your stay in Mammoth. Email our team member, Eric, to learn more or get set up with a free portal. When we get the inevitable question of “how’s the market up here?”, we have been telling our clients that we are still below the peak from ten years ago, unlike the rest of California! Most of southern California is well above the the peak from ten years ago. So is it a good deal to buy in Mammoth right now? Since Mammoth’s real estate market has typically followed SoCal’s market, then possibly it is. There was some frothiness in our market ten years ago when financing was easy and when buyers believed that condos built by Intrawest (i.e. Village, Westin, Juniper Springs Lodge, etc.) would be a great investment (in terms of appreciation) and generate good rental income. The latter was true, especially in the good snow years, but then the bottom fell out of our market, like everyone else’s during the Great Recession. The drop in the red line of the graph went from $915/sqft to $369/sqft in 2012, a 60% drop. The current level of $494/sqft is still 46% below the peak. Not that we are expect to hit that same peak soon, mainly because financing got really tough for these ‘condo-hotels’ (where a lot of foreclosures happened in 2009). The blue line for the Non-Intrawest condos (i.e. Snowcreek, SeasonsIV, Summit, and everything else), shows the drop going from $520/sqft to $231/sqft, a 56% drop. These condos are generally older than Intrawest condos and located further away from the slopes, which explains the consistent value gap below Intrawest condos. These are still 41% below their peak. So basically, the story from the last ten years is that we peaked (like the rest of the state) in 2007, then dropped like a bomb to 2009, kept going down until hitting rock bottom in 2012, jumped up a bit in 2013, then flattened out during our drought years, and now are going up again in 2017. We had a great snow year (too great? asks some locals with chimneys that were chopped off by snow sheds), which always helps. And the announcement in mid April that Aspen Resorts is attempting to purchase Mammoth Resort helped boost things recently and we are having a strong summer selling season. How much further will we go? Will SoCal reaching new heights, some buyers are looking for bargains elsewhere. We recently sold a townhome to a couple buying their first home; they could only afford to rent in Manhattan Beach so they bought their first ‘home’ in Mammoth! And those folks who have made great gains over the last 5 years are selling their investment properties in L.A. and deferring their capital gains taxes by buying a like-kind property in Mammoth with 1031 Exchanges. So the demand is still strong and our inventory is lower than average, so this should lead to more price gains. This entry was posted in Real Estate Blog on July 25, 2017 by Dennis Cox. Big news in Mammoth today! Word just came out this morning that Aspen Skiing Company and KSL Capital Partners, LLC, are purchasing Mammoth Resorts for an undisclosed amount. Click Here to view an article from the Denver Post. This has definitely created a buzz here in Mammoth (and outside of Mammoth). What will this mean for the MVP season pass and for overall pricing for resort products? 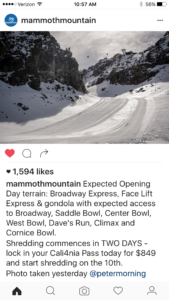 what will it do for the Mammoth Mountain Ski Area brand? We remember the disappointing feeling that Mammoth was getting ‘corporatized’ when Starwood Capital bought MMSA from Intrawest and Dave McCoy in 2005. But they seemed to be able to keep the boutique feel of an independent ski resort (mainly by keeping key people in place, the veteran employees who have been here over 30 years), but also innovate and improve operations and marketing. And when Mammoth (with June) bought Big Bear and Snow Summit, it seemed like a logical next move. Does this now seem like the next logical move, to be acquired by Aspen? Rusty Gregory, CEO of MMSA seems to think so, according to his resort’s press release this morning. But he also states that Mammoth will “continue to operate on a standalone basis but coordinate closely with our new partner resorts.” Rusty also disclosed that he will continue to own part of thew new company. We have experienced (and are continuing to experience) an amazing winter here in Mammoth and, given this news, it should be an interesting spring for our real estate market. With an already low inventory and healthy demand, there may be more confidence among buyers that a name like Aspen will just add more stability to operating a world class ski resort, restaurants, mountain bike park and partnerships with our local airport. We would also anticipate that with new ownership we may see new capital improvements on Mammoth Mountain that have been put on hold for years. Stay tuned. Your comments are welcome! This entry was posted in Real Estate Blog on April 12, 2017 by Dennis Cox. Inventory Plummets as Mammoth Mtn gets ready for Opening Day! Wow! !…As of today (11/8), we only have 108 condos listed for sale here in Mammoth! This is the lowest that this number has been in 2 1/2 years. As mentioned in our last newsletter, it is typical for the inventory to drop this time of year. It is a combination of (1) buyers purchasing places before the ski season and holidays, and (2) sellers pulling their condos off the market to use them for one more season (or rent them). But this number is LOW! Should be an interesting winter in the real estate market here in Mammoth. Opening Day for Mammoth Mountain is just TWO days away!!! I was up at Main Lodge late yesterday and the Mountain is looking majestic. If you like to ski the top, it looks like there’s some decent snow up there, especially for this time of year. They are planning on running Chair 1, Chair 3, both upper and lower gondolas and are expecting to open Broadway, Saddle Bowl, Center Bowl, West Bowl, Dave’s Run, Climax and Cornice. Here is a photo from Instagram posted by Mammoth Mountain showing the back side of Chair 3…looks inviting! Can’t wait to get out there and make some turns later this week! This entry was posted in Real Estate Blog on November 8, 2016 by Dennis Cox. Do you want to remodel your kitchen, or maybe upgrade your bathroom? Well, it’s quite possible that you are in need of a Licensed Contractor. By California’s definition, a contractor is someone who does over $500 in labor and material improvements to your property. What does it take to become a Licensed Contractor? Licensees must pass a state exam, carry a $15,000 bond, have four years of experience/ supervised work, and meet other requirements to acquire a license. Licensees must not only prove that they know their specific contracting skill(s) but also know contracting law. You can look up a licensee Here using their license # to see if any complaints have been filed and other info about their license. There are 44 different contracting specialties from a General Contractor to a Solar Contractor. To see all the types of contractors Click Here. A general contractor is one who practices multiple skills and must use at least 2 unrelated skills on a job where a specialty contractor can focus on their expertise. Looking to be an owner-builder? It is important to understand the risks involved. You need to know how to pull building permits, understand your responsibilities, and ultimately realize that the integrity of your project lies with you. Click Here to view more tips and warning for owner-builders. Also, the town of Mammoth requires you sign a Owner-Builder Declaration to ensure you assume the responsibilities. Using a licensed contractor protects you against fraud, faulty construction, and protection if you are unsatisfied with the work. Also, if people are on your property who is liable if an injury occurs? It is up to the property owner to hire someone who they can hold accountable. To view other benefits of hiring a contractor visit http://www.cslb.ca.gov/. California law states that property managers (i.e. for Mammoth condo complexes) are required to have a license if they are doing jobs over $500, even if it is just routine maintenance. Also, the closest enforcement agency is in Fresno. They rarely visit Mammoth to check out work sites. However, the best protection as a property owner is to look up a contractor yourself Here. **Most of this information applies to both general and specialty contractors. This entry was posted in Real Estate Blog on October 24, 2016 by Dennis Cox.